Have you heard of miraDry? It’s a device that microwaves your underarm sweat glands. Yes- literally microwaves them. Using heat to selectively seek and destroy is not a new concept. That’s how laser resurfacing works, among many other things. In this case, it’s seeking and destroying the sweat glands. Here’s an interesting fact: there are two different types of glands in your underarms. One kind produces sweat (the wetness) and the other one produces the odor and whatever makes the underarm area of an old white t shirt yellow. Miradry zaps both, and as a special bonus, the underarm hair too. I’m sold. There are people out there who have hyperhidrosis, that’s when the sweat glands are stuck in overdrive mode. I don’t have that, but when I stood up in my best friend’s wedding a couple of years ago, the photos revealed that I must of been a little nervous presenting my maid of honor speech- my satin gown gave me away with some classy sweat marks. Nice. Ok, it’s true that I’m not giving speeches in satin dresses all the time. So why did I do it, then? I hate anti-perspirant. I’m actually allergic to almost every kind on the market. The only one I wasn’t allergic to became Discontinued, so I’ve been ordering it for the last couple of years on Amazon. Whether or not that ends up being true, I think reducing how much chemical is on my skin on a daily basis is probably a good idea. 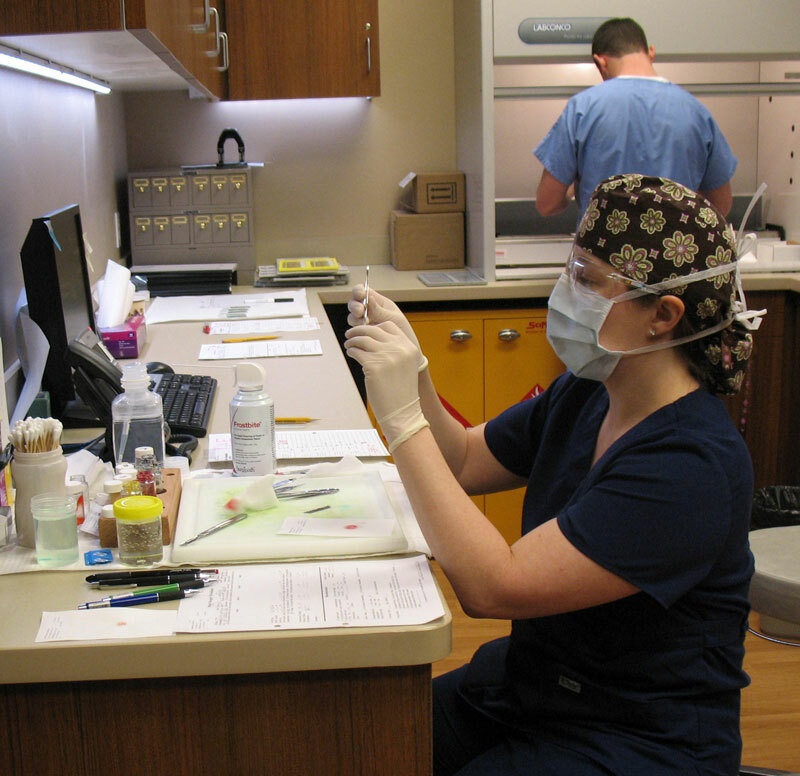 Miradry treatment can take 1 or 2 treatments to work. I ended up doing two, just to really nail it. I’ve been really really happy since then, and so have my underarms (no allergic reactions here)! Satin dresses are no match for me now! Here’s a link to my office’s page on miradry, check it out! 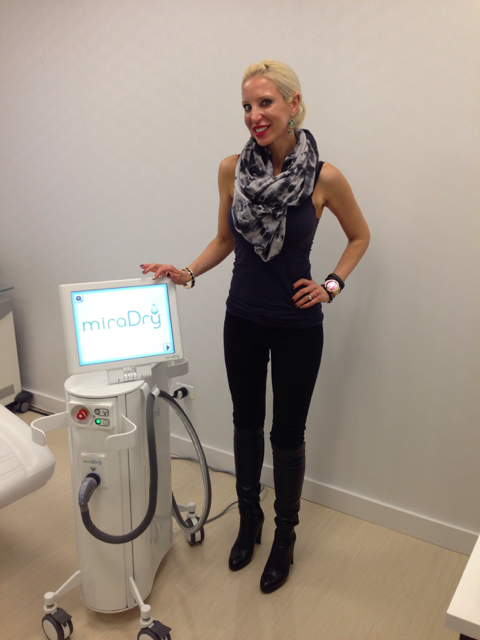 Here’s me with the miradry device at Erickson Dermatology in Chicago right after my treatment. It’s actually quite the relaxing experience! It’s about time I share my experience with ‘Botox in the bands’, aka the Nefertiti lift. My boss, Board certified dermatologist Dr. Quenby Erickson performed the procedure for me, which I love, love, love. 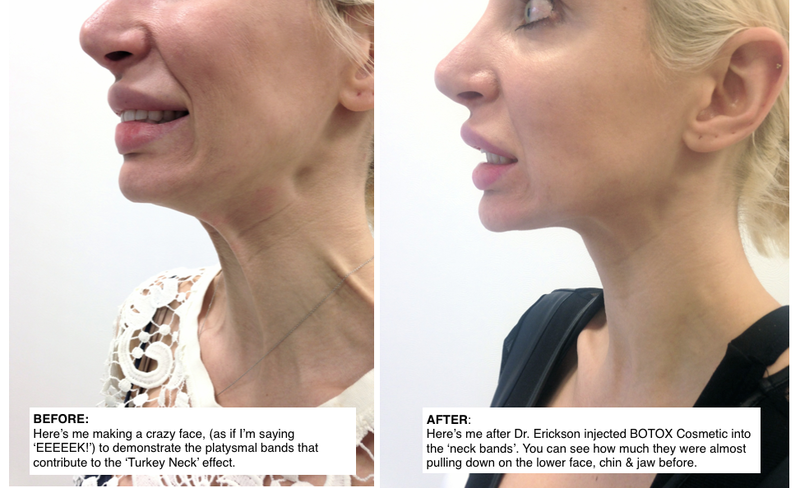 The Nefertiti lift is a non-surgical technique used to make the Neck, chin and “Gobbler” area look smoother and younger by injecting Botox into the platysmal bands. As it turns out, these bands are partly responsible for the downward pull on the lower face (Either side of the chin) and the development of the dreaded ‘turkey neck’. Ok… it could always be worse. this simple procedure was done in less than maybe five minutes. It didn’t hurt, and after it was done I went on with my day, not giving it another thought. Dr. Erickson used 30 units of Botox to treat me, but everyone will be different. As the Botox kicked in during the next week /10 days, I started to notice that the treatment made a surprising difference to me. I originally tried this for experience/learning and preventative purposes, But as the effect set in, I noticed a really nice change that I’m really excited about! To me, it looks like there is less tendency for any ‘pulling down’ by the corners of my mouth and chin, in addition to improvement in my neck, “gobbler” area ((technical term?? Ha)). My jawline is more defined in an elegant, pretty way. I’m liking that! I love the jawline definition I have now, (even though I would not have necessarily listed that as an area for improvement on myself before). Keep in mind, everyone is different, so depending on how many units (I had 30, but I regularly see 50 plus in the office) and how much lift you need, results will always vary. BUT if you have an open mind and would be satisfied with a nice, subtle improvement, this is worth a go!! You gotta help me, doc! …BOTOX my bands! Am I looking any more like Nefertiti yet?? Mohs Surgery… Nose Surgery??? Moe’s Surgery?? Here’s Dr Erickson performing a Mohs surgery. To the patient: Don’t worry, Dr E trained at MD Anderson Cancer Center. You’re in good hands! Named for Frederic Mohs (1910-2002), this specialty surgical procedure allows the physician to remove the cancer while sparing as much healthy tissue as possible. 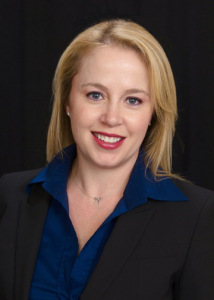 With more than 2 Million Americans estimated to be affected by skin cancer this year, Mohs Micrographic surgical technique is more in-demand than ever. In addition to Mohs, Dr. Erickson also really enjoys the reconstruction aspect, which has saved patients from disfigurement. It’s a pretty great process. Step 1: A conservative amount of tissue is removed. Step 2: While the patient waits, the tissue will be examined under a microscope to see if the margins are clear Step 3: If the margins are clear, the patient is good to go. 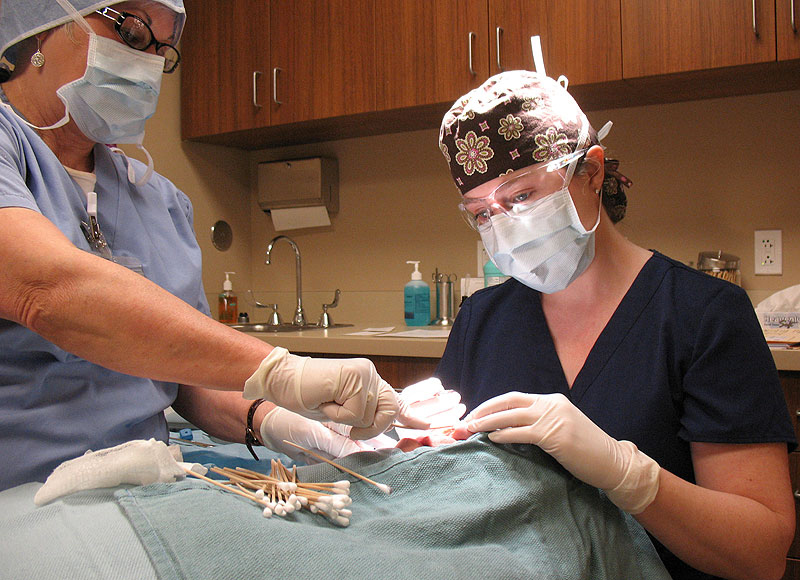 Slightly more tissue will be removed and the steps will be repeated only if the margins aren’t clear. Here’s Dr E checking to see if the margins are clear. Imagine if you had a cancerous lesion on your cheek (yikes). You’d want the cancer to be gone, but with the smallest amount tissue removed as possible. Beyond that, you’d want to be reconstructed beautifully. That’s what a Mohs surgeon can do for you. (Sometimes, closures can be sent out to a plastic surgeon). As Dr. Erickson says: “Removing tissue from a person’s back is one thing; it becomes a bigger deal on the lip, eyelid or nose.” Glad to have you, Mohs surgeons!! Click here for what sets fellowship-trained Mohs surgeons apart from the rest, and click here for patient information on Mohs surgery. Until next time: Stay Fabulous, (and wear your sunscreen!!) My Friends!